We have dined at Julie’s Park Café & Motel many times, and we have always enjoyed it. The setting is comfortable, the food is very good, and they are open for breakfast, lunch and dinner – and we have had all three here many times! Read on – you will like Julie’s! DoorCountyNavigator.com thinks you will like this place! Having dined at Julie’s Park Café & Motel often, we know that it is a consistency to their quality. 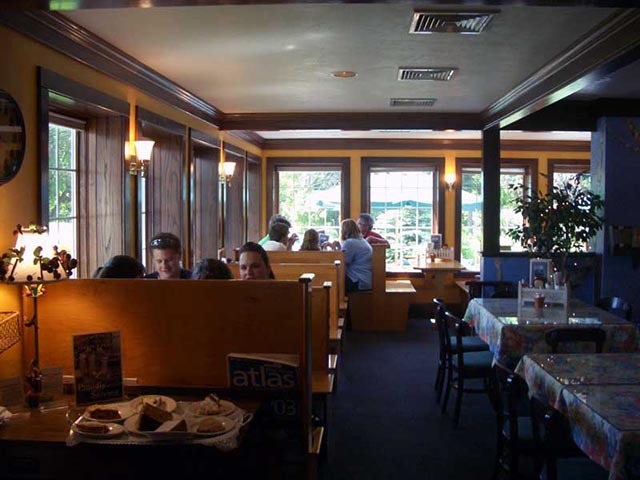 We enjoy the comfortable décor, soft colors, friendly staff and good food! For breakfast, we have had the oatmeal with their wonderful raison pecan toast and brown sugar. If you want something more substantial, then try one of my favorites, the Kamikaze Cakes, which are buckwheat cakes (2) with blueberries, bananas and pecans. Very good. There are lots of other choices too, like stuffed French toast, cherry crepes (have to have cherries!) or granola yogurt and fresh fruit. Egg dishes offer you another great selection – omelets of every kind, breakfast sandwiches, veggie omelets and you can even substitute cholesterol free eggs for a slight up charge. You can ease up and eat healthy or load up and get the Heart Stopper breakfast with 3 eggs and 4 sausages or bacon. More too, like cereals, sides of toasts, English muffins, bacon, sausage, etc. You can view their complete menus on line at their website. And there is a children's menu as well. And remember – breakfast is served all day – we love that option, just in case you are getting a late start to your day! The menu stays consistent, for breakfast and lunh only. No dinner hours in 2018. So whether you come in for breakfast or lunch, you will find lots of choices from soups, salads, and bigger meals – you will definitely find something you like. Salads again offer lots of choice – from vegetarian to a special Door County Cherry Salad (which I love). Made-from-scratch soups like whitefish chowder or vegetarian chili are delicious. Yes, there are plenty of burgers and wraps too. Try the DC Style Burger with dried cherries, caramelized onions and Swiss cheese – a unique combination of flavors that will send your taste buds over the top! Save room for dessert. Well, you cannot save enough room for these desserts – especially the mile high carrot cake. Three of us stopped in one afternoon for some coffee and dessert. We each ordered coffee. And we order ONE mile high carrot cake. How one person got this thing to the table is a mystery – really, I thought they would need a fork lift. It was fabulous, each of us had some . . . and we took the rest to go! Desserts are terrific – same some room, or share! As you can tell, we have dined here a lot. Friendly staff adds to the pleasantness. 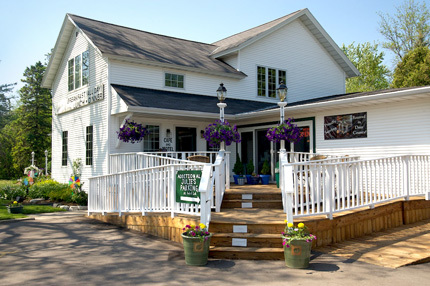 DoorCountyNavigator.com thinks you, too, will enjoy Julie's – for breakfast, lunch, dinner – or just a dessert. And please, when you dine there, please tell them that DoorCountyNavigator.com sent you in! You may even want to stay in their motel next door!